And I wouldn’t care if they have fled your mind. Now why do you sit and sulk so, my huzoor? There is no cause for displeasure in our tale. Are we mere companions or explorers of heavenly love? Is this a night among friends or the heights of paradise? The presence of any other thing in the world. Our destiny is death and morning is near. A poet, my youth, and the smile on your face. Now why do you sit there sulking so, my huzoor? Hey! You stars, wandering in the jungle of this night! Call it a day, call it a lifetime! Are only an excuse to remember you. What value is there in my verses? For this is our love, this is our lifetime. We only share this one lifetime. These are webs, Ishrat, entrapped. Untangle yourself from memory, be free. Do strange rhymes have value in life now? These vessels might drown and die now. Together, we cry for life now. Leave those nights, open your eyes now. Concealed now from the people of the world. Yet I yearn for the one who abandoned me. Raise our goblets, raise them with the clouds. I fear I’ll lose you somewhere among the flowers. Upset, you camouflage yourself in the garden. The wine graces me with such faith, such emotions, such sincerity! Strange folk are those who revel in drink. Don’t fall for her promises, oh distressed-heart, don’t do it! She’s only grazing by you, forward, in transit. And with the other, erase its script from our nation. Lost to the world, I sing for them. For the ones I have hurt, I sing for them. In their gardens of disguise they don’t budge, I sing for them. In revelry the drunkards overcome, I sing for them. Don’t go trusting their promises! Oh, troubled heart, don’t go! Those who leave and don’t return to us, I sing for them. From our nation, they subvert, I sing to them. The Indian poet Amrit Lal “Ishrat” was a respected scholar of history and literature in India during his lifetime. A collection of Ishrat’s most popular ghazals—written roughly in the period between 1955 – 1975—was published in both the Urdu and Devanagari scripts in the collection entitled ‘Yaadgar-E-Ishrat’ (“Memories of Ishrat”) in 1994. He was also my grandfather. Ishrat’s speciality was the ‘sher-o-shayari’ format of Urdu poetry. Each ‘sher’ is a rhyming couplet that must strictly be kept within its predefined meters per line. A number of these couplets can be formed together to be made into longer poems, called ‘ghazals’, which usually continue the same rhyme and metric scheme throughout in exploration of a common theme. The ghazal is a strict format, whose value and aesthetic quality depend almost entirely on its formal structure. The repetition of key words adds a rhythm to the recitation of the ghazal, and prepares the listeners—or readers—to focus not just on the word that is repeated, but the rhyming word that precedes it in the rhyming lines. It is through this language of repetition and cleverly-placed emphasis that the reciter or writer is able to reach his audience. In translating Ishrat’s ghazal into English, I hoped to keep both the strict, repetitive format of the ghazal while not losing its essential meaning. I realized that, by focusing on one, I was sacrificing the other. The solution, I discovered, was a synthesis. Presented here are two versions of each of Ishrat’s most famous works, The Verse—a translation that attempts to stay closer to the meaning of the poem’s original Urdu; and The Ghazal—a structurally formal translation that modifies the poems to pay closer attention to the classical Ghazal format. In this way, I hope to transfer over the cultural aspects of Urdu even as the poems are read in English. 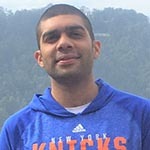 Karan Madhok is an Indian writer and a graduate of the MFA programme from the American University in Washington DC. His short fiction has been published online and sports journalism work has been frequently published for SLAM, Nation of Sport, NBA-India, and more. He won American University’s 2018 Myra Skralew Award for the best MFA Thesis (prose) and is currently working on his first novel. His poetry translations have also been published on The Literary Review. Amrit Lal “Ishrat” Madhok (1930-1989) was an Indian poet, professor, and historian. He published nearly a dozen books on his lifetime, focusing on subjects of Iranian history, literary criticisms of well-known poets such as Ghalib, and the history of Urdu shayari in Varanasi and beyond. Outside of his academic work, he published several of ghazals in Indian literary journals, most prominent of which appeared in Bisawi Sadi. 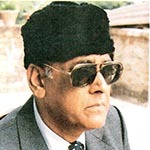 A collection of his most popular ghazals–written roughly in the period between 1955–1975– were published in both the Urdu and Devanagari scripts in the collection entitled Yaadgar-E-Ishrat (“Memories of Ishrat”) in 1994.